As we are quickly approaching Thanksgiving and Black Friday, Union State Bank wants to remind you of some important tips when you are out and about after your Thanksgiving feast. Below are tips to help you save money, protect your identity, and hopefully enjoy your time shopping. Do your homework. Have a plan of what you need and where you can find the item at the lowest price. 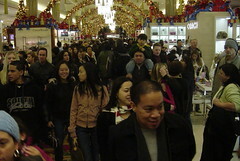 Shop on Thanksgiving Day. Although this has been controversial, there may be some deals that are too good to pass up on Thanksgiving Day. Retail stores are doing whatever they can to beat the competition for sales. Secure your purchases. Place items you purchase in the trunk of your car or out of view of a thief. Guard your cash & credit cards. With the large number of people in stores, it is very easy for someone to grab a purse and flee. Keep your cash and credit cards in your front pants pocket. Charge your cell phone. If you are shopping with a group, this is a must. Also keep your phone in your pants pocket…especially a smart phone that has personal data on it. Know the return policy. Some items purchased on Black Friday have a more strict return policy. Be sure you know what the policy is. Get a gift receipt. Face it, you won’t be able to make everyone happy with his or her gift. A gift receipt makes it easier for the individual to return the item and get what he or she wants. Stick to your budget. Don’t overspend this holiday season. Make a budget and stick to it. Avoid the crowds. If you can do without the hustle and bustle of Black Friday, consider shopping online. Most stores offer Black Friday deals online beginning Thanksgiving Day. Use Coupons. Many stores offer free shipping with online purchases. You may also be able to find other online coupons to lower your total bill. Use your smartphone. There are apps designed for Black Friday. Explore these apps as they may be useful for your shopping experience. Know what to buy. Certain items are actually less expensive at other times of the year. Examples are higher end electronics and jewelry. If the Grinch strikes. If you happen to lose your credit or debit card, contact your financial institution immediately. Delaying this could leave you liable for unauthorized charges! This entry was posted in General and tagged Banks, Black Friday, Christmas and holiday season, Coupon, Credit card, Money, northeastern WI, Online shopping, Receipt, smart shopping, Thanksgiving, Union State Bank. Bookmark the permalink.